The FAI announced today that the 2015 edition of the FAI World Air Games has been awarded to the United Arab Emirates and will be held in Dubai. This multi-discipline event will be organised by the Emirates Aerosports Federation and will take place over a period of 12 days in December 2015. It is the only world competition that brings together the various different air sports. A meeting between FAI’s representatives and a delegation from the UAE was held on Wednesday in Lausanne, Switzerland, where final discussions led to the signature of a Memorandum of Agreement by Dr. John Grubbström, FAI President, and His Excellency Nasser Al Neyadi, President of the Emirates Aerosports Federation (see photo above). Flagship event of the Federation, the FAI World Air Games is a combination of elite competition and spectacular demonstrations, which exemplify the very best that air sports have to offer. The 4th edition will include Powered and Glider Aerobatics, Aeromodelling, Amateur-Built and Experimental Aircraft, Ballooning, Gyrocopters, Hang Gliding, Helicopters, Microlights, Paramotors, and Parachuting. The UAE delegation consisted of His Excellency Nasser Al Neyadi; Mr. Yousif Hassan Al Hammadi; Mr. Rami Bassam Al Nabulsi; Mr. Mohammad Yousif; Mr. Salim Akram; Mr. Didier Mary. The Emirates Aerosports Federation (EAF) is an Active Member of the FAI. It was established in 2012 as a non-profit organisation to coordinate and give direction to the fast development of air sports in the United Arab Emirates. EAF activities include the establishment of rules for the control, certification, and regulations for the air sport events which are organised by members within the Emirates. EAF also promotes safety in sport. The Dubai International Parachuting Championship has taken place each year since 2010. 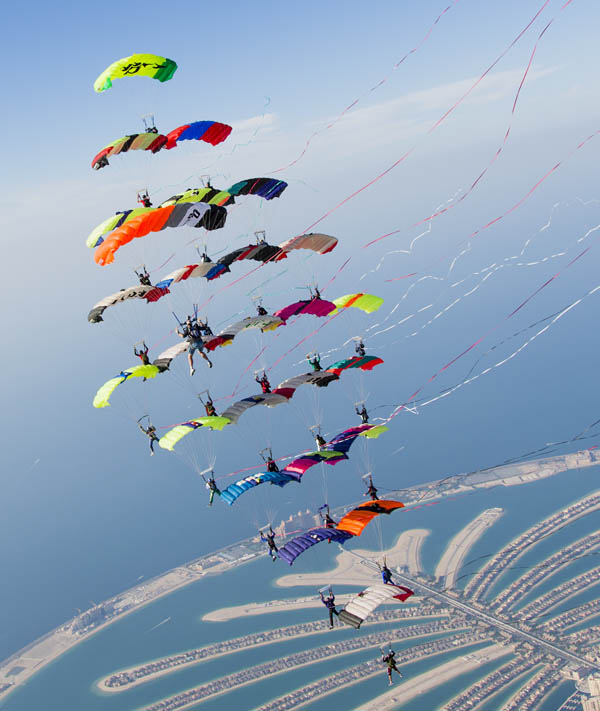 In 2012, Dubai hosted the FAI World Parachuting Championships (Mondial 2012) with 1,440 participants from 57 countries participating in 13 different disciplines, thus making it the biggest ever Parachuting event. Many other air sports events took place in UAE in the last few years, including the Al Ain Aerobatic Show and the Red Bull Air Race Abu Dhabi.